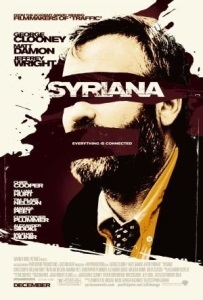 Rolling Stone: Syriana, written and directed in a fever of risk-taking provocation by Stephen Gaghan, takes off with the lightning speed of a thriller, the gonzo force of frontline journalism and the emotional wallop of a drama that puts a human face on shocking statistics. Global oil corruption has seeped into every facet of our lives, from the collusion of White House and business interests in the Persian Gulf to the financial squeeze we all feel just pumping gas. No dry civics lesson, this fighting-mad film isn't just hot, it's incendiary. And no one gets off the hook. You see it with the exhilarating feeling that a movie can make a difference. Roger Ebert: The movie's plot is so complex we're not really supposed to follow it, we're supposed to be surrounded by it. Since none of the characters understand the whole picture, why should we? If the movie shook down into good guys and bad guys, we'd be the good guys, of course. Or if it was a critique of American policy, we might be the bad guys. But what if everybody is a bad guy, because good guys don't even suit up to play this game?What if a CIA agent brings about two assassinations and tries to prevent another one, and is never sure precisely whose policies he is really carrying out? The movie has a lot of important roles, and uses recognizable actors to help us keep everything straight. Even then, the studio e-mailed critics a helpful guide to the characters. I didn't look at it. Didn't want to. I liked the way I experienced the film: I couldn't explain the story, but I never felt lost in it. I understood who, what, when, where and why, but not how they connected. That was how I wanted to relate to it. It created sympathy for individual characters in their specific situations without dictating what I was supposed to think about the big picture. AV Club: Gaghan brings in many more players, but edits the film into the lean, propulsive shape of a thriller. That ends up being something of a problem; some sub-plots never fully untangle and characters get lost as Gaghan rushes toward a conclusion that, taken on its own, is the stuff of a slightly hysterical leftie pamphlet. (On the other hand, in a political era where talk of secret prisons, torture as policy, and betrayed CIA agents has become standard, who knows?) Whether it goes too far remains open to a debate that will probably divide viewers along their existing political sympathies. But there's little debating that Gaghan's smart, universally well-acted film generates a queasy kind of excitement as it moves from pipelines to boardrooms to run-down hotels and other little-seen corners of an oil-driven world. In the process, Gaghan reveals the full extent of the mess we're all in while providing a reminder that it's not just superheroes locked in a struggle between good and evil. NYTimes: Someone is sure to complain that the world doesn't really work the way it does in "Syriana": that oil companies, law firms and Middle Eastern regimes are not really engaged in semiclandestine collusion, to control the global oil supply and thus influence the destinies of millions of people. O.K., maybe. Call me naïve -- or paranoid, or liberal, or whatever the favored epithet is this week -- but I'm inclined to give Mr. Gaghan the benefit of the doubt. And even if the picture's rendering of current events turns out to be entirely off base, the energy, care and intelligence with which it makes its points are hard to dismiss. The Guardian: It's all very complicated and wears this ostentatious complication with a kind of macho pride, as if raw reality resides in this contrived thicket. But what complicates the plot is writer-director Stephen Gaghan's reluctance to criticise America too much. Instead of complexity, there is a blank, uncompelling tangle, which conceals a kind of complacent political correctness. It is not a conventional paranoid thriller, because there is nothing to be paranoid about. However tricky the details, the mystery is already solved. The petro-political complex is to blame, but Stephen Gaghan does not care to state it so baldly, perhaps fearful of unsophistication or anti-Americanism or just taking a clear position. (George Clooney has himself repudiated the campaigning cinema of Michael Moore.) Gaghan's movie is well shot, influenced by Michael Mann and Oliver Stone, and well acted; Damon's character is potentially interesting and even tragic, but Gaghan is careful to endorse only free-market liberalism as the acceptable side of Arab nationalism in the Middle East. The only Muslims are extremists and suicide bombers. Moderate Islam does not exist. Empire: Still, as soon as the various protagonists attempt to take charge of their own fate, the net suddenly draws tighter and the stories converge in both surprising and tragically predictable ways. As the movie accelerates into a breathless final act, salient details are left behind (none of the personal particulars amount to anything significant), and the narrative never quite justifies the roots-of-terror thread that is central to Gaghan’s thesis, but by the time you can recall the forgotten faces the momentum is irresistible, the climax shattering. Syriana and Iraq--War for Oil? George Clooney’s new movie hits uncomfortably close to home. A bleak but well crafted movie. That ends up being something of a problem; some sub-plots never fully untangle and characters get lost as Gaghan rushes toward a conclusion that, taken on its own, is the stuff of a slightly hysterical leftie pamphlet. It was only 13 years ago but it some ways, 2005 may as well have been 30 years ago.